After taking a more supporting role in this year’s The Ides of March, which was his fifth stint in the director’s chair, George Clooney has shown, once again, that he is not quite done being the leading man, after starring in this year’s The Descendants. This is a bittersweet film is about a Hawaiian landowner, Matt King, who, after his wife’s coma-inducing accident, attempts to reconnect with his estranged daughters, whilst also negotiating a stressful million-dollar land-deal. 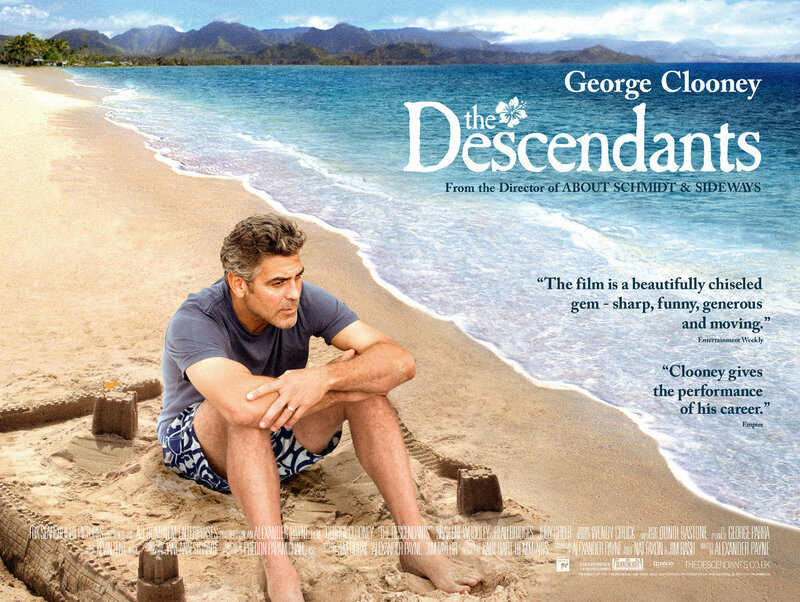 Teaming up with Alexander Payne, writer and director of About Schmidt, The Descendants always looked to be an interesting, quirky look at a man’s life, as he nears the edge of a breakdown. From the offset, the film’s ambivalent nature is put forward. Audience expectations of Hawaiian Islands with their tropical, sandy beaches and scorching hot sun are disposed of and replaced with overcast skies and frequent storms. The opening speech itself claims that King has not done any surfing for fifteen years, adding a depressive sense of unfulfilled desires that would be more suited to an urban inner-city. It is this odd, juxtaposing nature that remains constant throughout the film, through the characters, their situations and how they react to how their lives are changing. And it is this concept that gives the film a re-watchable charm. The acting in the film is really the biggest asset the film has to offer. Clooney is, as always, endearing, as the troubled protagonist, but it is the supporting acts surrounding him that make this film truly wonderful. Shailene Woodley and Amara Miller play King’s two troubled daughters, and play them well. Robert Forster as King’s angry father-in-law adds elements of comedy, as well as fear for all those around him. But it is the King’s tag-along friend, Sid, played by Nick Krause, who should be remembered the most. His bumbling idiocy adds an awkward humour to depressing and upsetting situations, in one instance leading to him receiving a punch to the face. The development of all of these characters, seen as the story progresses, adds an insight and reasoning to their actions and behaviours that makes the film an incredibly interesting watch, as the audience receives a much grander understanding of the characters that they are watching. Without too much of the story being given away, it seems fair to say that all is not plain sailing for the King’s on their journey. Unexpected plot twists are inserted, which keep the film from being predictable, whilst also giving off a very realistic, somewhat humorous, approach to an otherwise dreary situation. Furthermore, the characterisation in the film is very well executed, much the same as with Payne’s previous outing, Sideways, adding a depth and realism that could have so easily have been missed. Overall, there is not a lot bad to be said about the film. With a fantastic script, which rightfully received an Academy Award, and superb acting, it is a shame that it will never go down as one of the world’s greats. 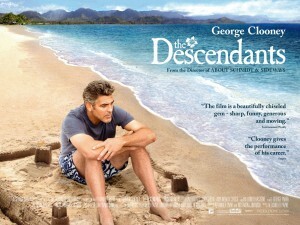 However, for anybody who has two hours to spare, The Descendants is a must-see, wonderfully written film that will keep you entertained as much as it will make you emotional. Tagged film, George Clooney, Hawaii. Bookmark the permalink.